Retired Missouri Governor and U.S. Sen. Christopher “Kit” Bond has a new mission – creating global Missourians. Bond served two terms as governor and four terms as senator – retiring from public office in 2010. He’s since resided primarily in St. Louis, working as a practicing attorney and chairman of Kit Bond Strategies – a firm that helps clients establish and maintain worldwide relationships. Several years ago, the Missouri native and numerous supporters established an endowment to fund a lecture series at the University of Missouri–Columbia. Bond is now working with university officials to shift the endowment’s focus and expanding its reach to include the University of Missouri–St. Louis. The new Bond International Scholars program will fund $5,000 study abroad scholarships – the initial class, announced Wednesday, includes five students each from MU and UMSL. 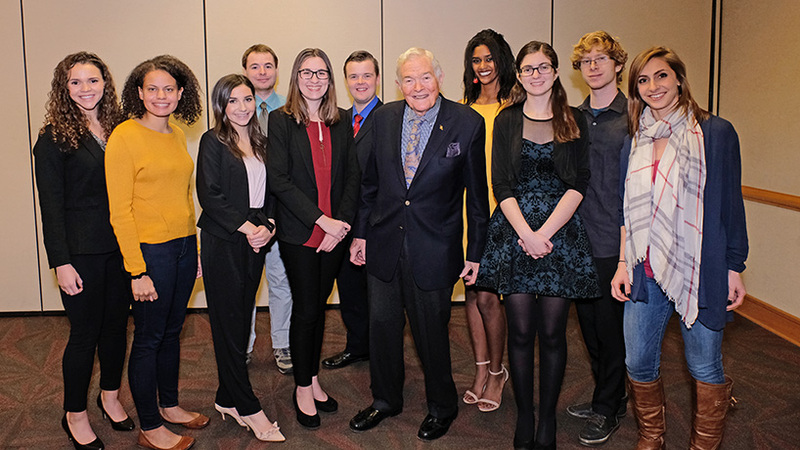 Bond was on hand at an afternoon reception in Century Room C of the Millennium Student Center to congratulate the recipients: Alex Beattie, Caroline Been, Sewit Belete, Madison Czopek and Oliva Hunt of MU and Cole Alves, Eric Eggers, Jordan McCain, Sara McFarland and Lauren Wilson of UMSL. Bond and university officials hope to award a higher number of scholarships next year by raising additional funds and repurposing the entire lecture series endowment. “My experiences growing up in a family engaged in international business gave me an appreciation for the interdependence that is the foundation of today’s global society and economy,” Bond said. “Throughout my career in public office, both as a Governor and as a United States Senator, and now in the private sector, a top priority for me is to help build bridges between different cultures and nations and to ensure Missouri remains competitive. 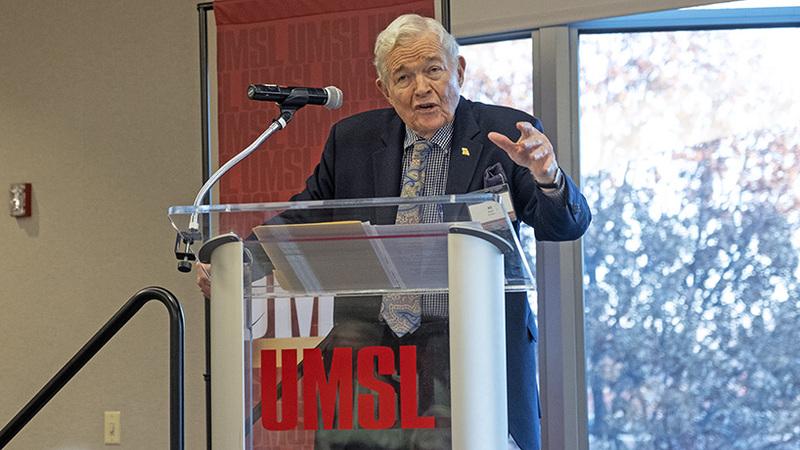 Bond credited university officials, including recently retired UMSL Associate Provost Joel Glassman, the longtime director of the Office of International Studies and Programs, for driving the creation of the new scholars program. For more information about the Bond International Scholars program, contact UMSL’s Office of International Studies and Programs at 314-516-5753 or MU’s International Center at 573-882-6007.